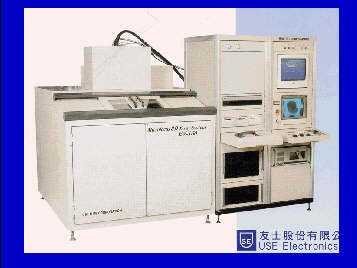 USE ELECTRONICS CO., LTD, 3-54-1, Chung Hsio East Road, Taipei, Taiwan, R.O.C. A new X-ray testing device has been developed for fast and highly reliable testing of very small defects in electronic circuits and parts, such as BGA and LSI, by using a psudo-3D X-ray TV system. The focal point size of a micro-focus X-ray is nearly 1mm, so that very high resolution has been achieved, and a wide radiation angle of the X-ray source has enabled the I.I. TV camera to move very widely and to take the image of an electronic board without tilting it. The X-ray tube voltage can be set between 10 to 160 kV. The 3D display of the objects and multi measuring software provided give the very useful tool for defect-analyses. For increasing of current needs of nondestructive testing in the electronic industry and fine materials fabrication, more sensitive and faster x-ray testing methods are requested. The objects in these fields have various shapes and usually the defects included in those objects are very small and variable. In order to test these objects with high detectability for small defects, highly sensitive and fairly faster radiography testing methods are required. Conventional film method is too slow and not real-time imaging for the testing, Therefore we cannot use such film methods for the cases. The old style radioscopy method using conventional micro-focus X-ray tube with a simple movement of a detector system also cannot be enough for such applications. Because samples and defects are very small, so that very high resolution of the testing system must be needed, and usually to detect the cracks in such objects effectively, special viewing angles in the testing must be searched. Recently several techniques, such as computed tomography 1), laminography or tomosynthesis techniques 2), fine digital radioscopy 3-6) are reported. However, those techniques have still serious limits at real applications. 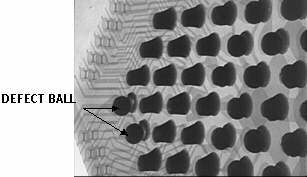 For an example, they are not enough to detect thin imperfections of solder junctions on a Ball-Grid-Array (BGA). Because the X-rays in those techniques must penetrate the relatively thick layers of solder balls, this rather strong absorption of X-rays obstructs to detect the very small contrast change by the thin defects at the junction. To improve the situation, a new U-centric mechanism of a testing system has been developed. In the U-centric mechanism, a focused point for testing is fixed, and a viewing angle for the point can be changed very widely. Nearly 3D investigation of the object can be achieved by the U-centric method. In this work, we report the study by the U-centric system and discuss the examined results for electronic boards and parts. The most troublesome defects in BGA is the thin defects or thin detachment between the solder balls and the printed circuit on the electronic board, shown as Fig.1. Conventional methods of radiography testing including laminography use the images obtained by the penetrating X-ray through the solder balls from upward to downward. However, rather strong absorption of X-ray by the solder balls hides the very small contrast change due to the very thin detachments of BGA. for a large magnification of imaging, as shown in Fig.2(a). Whereas a CT testing can take such a large viewing angle, sometime such as 90 degree to the normal direction of a BGA board. However, the electronic board under testing is not so small, so that spatial resolution of CT becomes serious limits for the testing. This situation and the cost of the testing usually reject the use of CT testing for BGA. To realize much faster and economical method, a U-centric mechanism has been developed. Figure 2(b) shows the principle of the U-centric mechanism. In this case, the BGA board is placed adjacent to the x-ray source without tilted, and an imaging TV device is moved in an x-z plane until the limit of X-ray radiation angle. The small distance between the x-ray target and the BGA can be allowed in the U-centric system for the large magnification of the testing. When the imaging device is moving, the BGA object is moved along with the x-, y- and the z-direction with keeping the constant focus point on the sample and the different magnification of imaging. Therefore, the focus point of viewing with x-rays is not changed when the viewing angle of the detector and the magnification of imaging are changed, that is, every time the viewing point is fixed on the same point of the BGA unless other viewing points are selected. This is another unique aspect of the U-centric system. With the wide movement of the TV detector, large tilting angles can be achieved, so that the small detachment at the junction of BGA can be detected. Moreover, the BGA sample can be rotated from 0 to 360 degree freely. The commercially available U-centric 3D radiography system (EV-160m1) has been developed, in which the x-ray focal point is 1mm, and the viewing angle of the image sensor is ranging from 0 to 60 o.The achievable geometric magnification is 1000. The tube voltage is from 10 to 160 kV, and the maximum current is 0.2 mA. Radiation angle is 130o.Each solder ball of BGA can be examined without any obstruction from next balls. The system has other functions, such as image processing, psudo-3D displaying, position indicator for viewing, and measuring of dimension and area. Figure 3 shows the outlook photo of the EV-160 m1. Several examples of the BGA and other images obtained by the U-centric radioscopy system are given as followings. Figure 4 shows the x-ray images of BGA taken by the system. The BGA joints a print circuit board and LSI, only whose circuit lines can be seen by the X-ray image. The array has 400 ball joints, and each sizes of balls are about 0.8 mm. Among those ball joints, two bad joints can be seen, that is, small detachments between the pads and the balls for the joints can be seen. Figure 5 shows the U-centric images of the bad joints of the BGA taken by the same system. Two bad joints are shown with the radiation angle of 45o with various rotation angles and rotation angles. As can be seen, the detachments are clearly detected with the irradiation angle at 45oand 60o. Whereas from the normal upward direction, the detachments can not be detected, as mentioned before. In this case, the detachment of the junctions are visible clearly. From these image data, it can be concluded that the U-centric radioscopy is very effective for testing BGA joints. Figure 6 (a) and (b) shows other examples of x-ray testing for a LSI board, in which (a) is the image of IC wire bonding and (b) is the image of through-hales. The shapes of these junctions are clearly observed. Fig 7: Example of the automatic testing of a BGA board. The U-centric radioscopy system has other functions including image processing, measuring and filing functions. It is also provided for the system to works as a data-base unit and on an individual company's net-work system as an image and data supplier. Moreover, the system has the optional other functions of automatic pass or not judgement for testing after image processing, and also works as a CT scanner for next 3D- CT reconstruction. 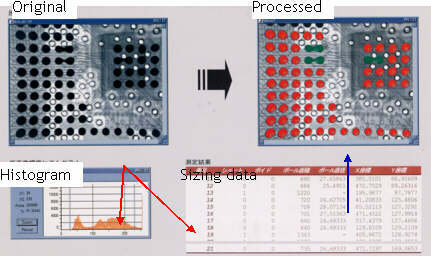 Figure 7 shows the example of the automatic testing of a BGA board, in which an original BGA image is processed to show bad joints automatically. The sizes and distribution of ball joints are judged to pass or not automatically. Y. Ikeda, Y. Mizuta and H. Tobita; " X-ray testing for parts and materials of ceramic gas turbine", Proc. of 8th Asia-Pacific Conf. on NDT,held on Taipei , Publ. NDT Soc. of China-Taipei, pp.33-40, 1995. Y. Kim, S. Kang and H. Cho; "A new x-ray digital tomosynthesis method for evaluating the soldering states of Ball-Grid-Array joints", Proc. of 9th Asia-Pacific Conf. on NDT,held on Anaheim, USA, Publ. ASNT, pp.152-155, 1998. Y. Mizuta and Y. Ikeda; "Development of a highly sensitive liquid masking method of X-ray testing with image subtraction", ibid, pp.163-166, 1998. Y. Ikeda, Y. Mizuta and H. Tobita; " X-ray image subtraction method for detection of small defects in ceramics"", Proc. of 8th Asia-Pacific Conf. on NDT,held on Taipei , Publ. NDT Soc. of China-Taipei, pp.349-356, 1995 . Y. Ikeda, Y. Mizuta and H. Tobita; "A new method of x-ray radioscopic testing for small defects in fine ceramics with image subtraction", Proc. of 1st US-Japan Symp. on Advances in NDT, held at Hawaii, USA, Publ. ASNT, pp.435-440, 1996. Y. Ikeda and Y. Mizuta; " Precise sizing technique for inner defects with image subtraction radioscopy", Proc. of 2nd US-Japan Symp. on Advances in NDT, held at Hawaii, USA, Publ. JSNDI, pp.462-467, 1996. Y.Ikeda, Y.Mizuta and R.Hirashima;" Radiography Testing for Micro Defects with a Psudo-3D X-ray TV system", Proc. of 5th FAR=EAST Conf. on NDT, held in Taiwan, pp.361-368,1999.